Go With Me is the kind of lower budget thriller that Hollywood seemed to make by routine back in the day, but since the inexorable rise of the blockbuster it has become more of the preserve of the independent filmmaker and smaller production company. Consequently when something as low-key as Go With Me (known as Blackway in some countries) has such a classy cast it sometimes comes as a surprise. Based on a novel by Castle Freeman Jr. and adapted by Gregory Jacobs and Joe Gangemi, it’s directed by Daniel Alfredson, who helmed the Swedish films of The Girl Who Played With Fire and The Girl Who Kicked the Hornet’s Nest. This movie co-stars Anthony Hopkins and features Hal Holbrook in a significant role for goodness sake – two of the most brilliant elder statesmen of film working today. Their voices alone are normally worth paying the admission price for. Ray Liotta and star Julia Stiles are both bankable actors too, so it is something of a surprise that this movie has come in under the radar with little fanfare. Which is a shame, because although it is simple it is also very good. 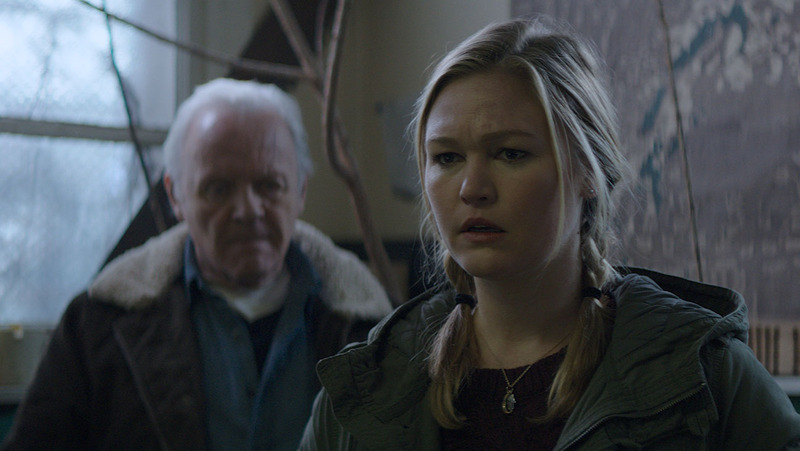 Set in a small logging community in the Pacific Northwest, the film starts when Lillian (played by Julia Stiles) who has recently moved back to the town following the death of her mother, goes to the local sheriff because creepy guy Blackwood is stalking her. The sheriff, clearly scared, is no help and recommends talking to someone tougher at the local lumberyard, which she does. This is where she meets Lester (Anthony Hopkins) who obviously has his own reasons for wanting to confront Blackwood – it takes some time to discover what these reasons are, but the pain they are causing him is written clearly on his face. The idea of this elderly man taking on such a terrifying figure automatically give the film a sense of a final act – a man acting because he has nothing to lose. The premise is a straightforward revenge film – little is explained of what exactly the boogie man bad guy Blackwood has done to everyone, but it’s clear that he’s not held in high regard by anyone in the town. Everyone is afraid of him, and that’s enough to make the audience wary. In this respect the film actually becomes more a thriller told using the trappings of a supernatural ghost story. Blackwood is a figure who haunts everyone and to reinforce this the film cleverly keeps him off screen for sometime – we just hear Ray Liotta’s voice and see him in silhouette. This very effectively increases the threat and he quickly becomes unknowable. Dialogue is spare to the point of virtual silence. When people speak every sentence is weighted, and it’s an extremely effective device. There’s a sense of something quietly agreed without speaking. The sparsity of the spoken word means that everything moves with relentless purpose. The long held resentment has an almost tangibly physical presence. So yes, it’s a simple film, but the acting chops of all involved raise it up. A later aspect of the story could be more clearly foreshadowed to avoid the feeling it has just been tacked on, but aside from that it’s a cracking tale, well told. Go With Me is out on DVD now.